The companies are regularly confronted with consequent volumes of liquid waste. And unfortunately an important percentage of this waste is composed of water. 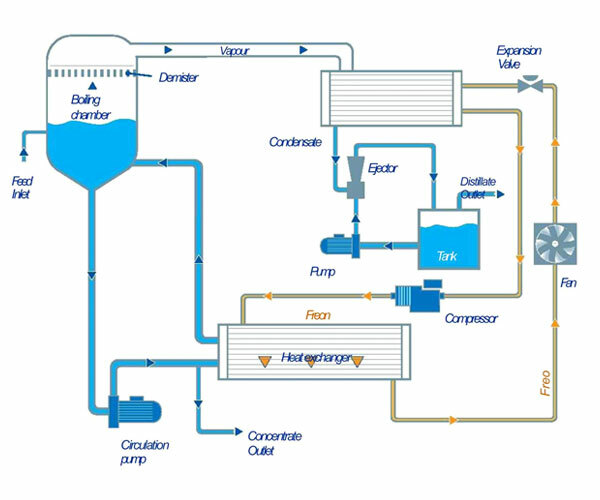 That is what gave the idea to reduce the volume of waste by recovering water by distillation. 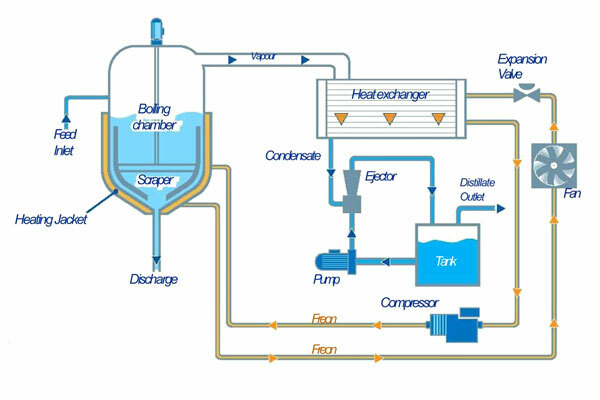 To lower the energy needs, two processes are used: the flash distillation, allowing an evaporation at low temperature (+-40°C) and the use of heat pump, allowing an extremely reduced energy consumption. And when the customer disposes over heat and cold, the need of energy nearly disappears. This process showed already its prove for a long time and has a very short ROI(Return One Investment), considering the realised economy. 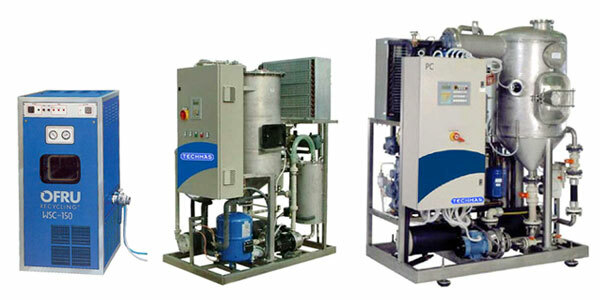 The WSC is the range of evaporators which uses heat pump for the treat of many kinds of waste water. This technology has been refined over many years in terms of flexibility, low energy consumption, and reliability. The priority has been put on the energy consumption, which is the lowest on the market. Ofru in co-operation with respected materials research centres, selects the most suitable materials for the safe management of aggressive liquids. The resistance to corrosion is the main features of every WSC evaporators, essential when dealing with extremely concentrated liquids. Austenic weakly bound structure, non-hardening, non-magnetic. The low percentage of Carbon in this alloy reduces the risk of intergranular corrosion at high temperatures. Uses: alkaline liquids, acid liquids (pH>4) with a low percentage of chlorides, oil emulsions, liquids from ﬂexographic printing. Austenic-ferritic structure, magnetic. The high percentage of Chrome gives excellent resistance to localised corrosion. Uses: acid liquids (pH>3) with high chloride and metals content, galvanic waste waters, landfill leachate. High ﬂexibility Cr-Ni.Mo steel. The low Carbon content ensures resistance to the formation of carbides at zones exposed to thermal variation. It has excellent resistance to localised corrosion, both in oxidising and reducing environments, even at high temperatures. Uses: very acid liquids (pH>2) with high content of chlorides, ﬂuorides and metals, anodising waste waters, special applications. Chemically inert material resistant to almost all aggressive substances, usually matched with another chemically inert material, PTFE, a ﬂuoride co-polymer used for coating the inner surfaces of the boiling chamber. Uses: pickling waste waters, galvanic wastewaters, and aggressive liquids. 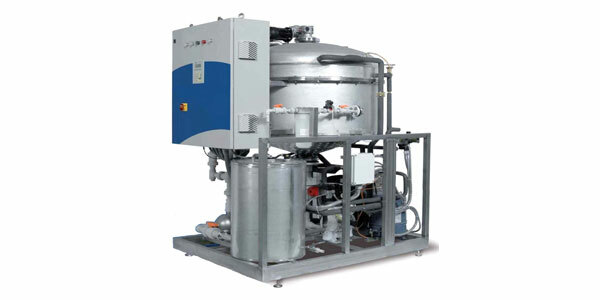 E series is designed to produce maximum distillate quality with minimum capital and operating costs. Each model is a compact skid-mounted unit, simple, safe and easy to move. Control is by a PLC, including the functions of feed and discharge, therefore allowing automatic operation and minimum supervision. All models are designed for continuous operation, 24hs/day, and require just an electrical supply and compressed air. E series evaporators operate in a high vacuum condition, with the boiling chamber pressure set at 5-6 kPa (absolute), in order to save the thermal energy produced by the heat pump. 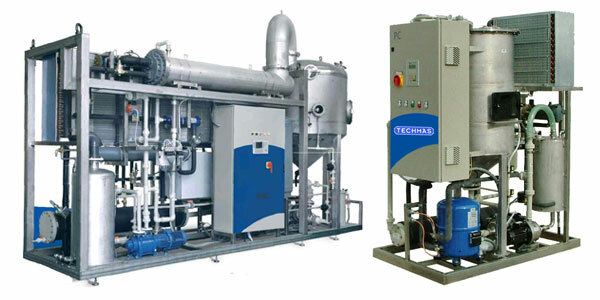 In this way the boiling temperature of the waste water is approximately 40°C (104°F) and typical phenomena (scaling, precipitation, corrosion) which may reduce the performance are either eliminated or much reduced.